Frequently, when a microbial population is transferred into a new habitat, noticeable cell division only commences after what is known as a "lag time". According to the food microbiology literature, this lag time can be determined by extrapolating the tangent to the growth curve at its inflection point to the line , where is the inoculum's original size. 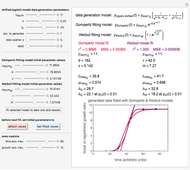 In this Demonstration, simulated growth ratio data, with or without random scatter, is fitted to the Gompertz or stretched exponential (Weibullian) models using nonlinear regression. The tangent method is then used to calculate the lag time with the fitted parameters. It is shown that the lag time so calculated can depend on the growth model chosen and be substantially longer than that marking the time where growth can first be observed. Snapshot 1: Calculated lag times when they hardly exist, if they exist at all; obtained by the tangent method. Snapshot 2: Lag times obtained by the tangent method when the Gompertz and Weibullian models closely agree. Notice the discrepancy with the time to reach normalized growth or a growth ratio of 0.01. Snapshot 3: Lag times obtained by the tangent method when the Gompertz and Weibullian models do not closely agree. Notice the discrepancy with the time to reach normalized growth or a growth ratio of 0.01. Delayed cell division in a bacterial population introduced into a new habitat is a topic of much interest and importance in food safety and microbiology in general. The "lag time", therefore, plays an important role in mathematical modeling of microbial growth. Since individual cells start and complete their division at different times, as can be observed microscopically, determination of the lag time is not a trivial issue. A common method is to record the growth curve, the number of living cells at time , which in most cases has a sigmoid shape, find its inflection point graphically or mathematically after fitting the data with a growth model, and draw or calculate the tangent line at the inflection point. The intersection of the tangent line with the line , where is the initial number, is considered the lag time [1, 2]. A notable issue with the tangent method is that the lag time it produces can be substantially longer than the time when the rise in the number of cells can be observed . Also, different growth models of comparable fit as judged by statistical criteria can render different inflection point locations and corresponding slopes. These features are demonstrated with simulated microbial growth data, with or without random scatter, using the shifted logistic equation  as a model. The shifted logistic model is , where the growth parameters , , and are entered with sliders, as are the plot axes' maxima. The number of points to generate is also entered with a slider, as is the amplitude of the superimposed random scatter, . The seed slider allows differing random point scatter for . 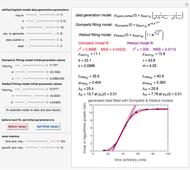 The generated data is fitted by the Gompertz and stretched exponential (Weibulllian) models. The three model equations are displayed and below them the fit level in terms of and MSE (mean square error). The growth curves and models are all presented in the form of versus relationships where or . The former is for small and moderate growth levels and the latter for extensive growth of several orders of magnitude . Either way, they are consistent with the fact that at , . 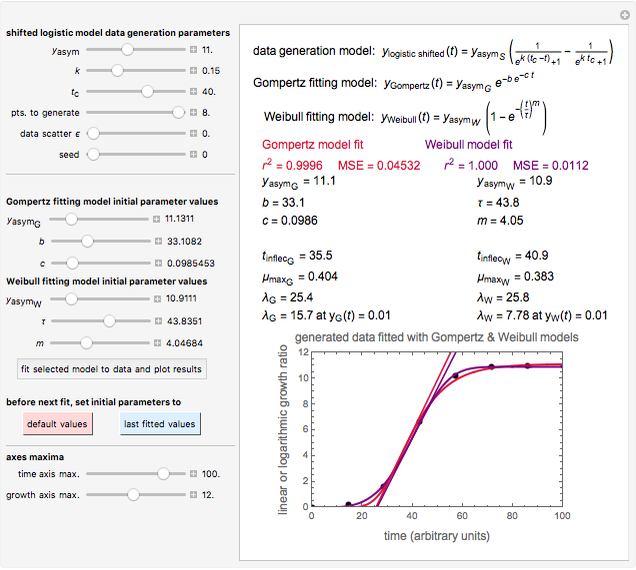 The two regression models are the Gompertz equation, , and stretched exponential (Weibull) equation, . To fit the data, you can modify the default parameters&CloseCurlyQuote; values until the plotted gray curves roughly match the data points (hint: always start by moving the slider first). 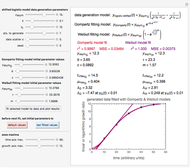 Once an approximate fit is obtained, click the "fit selected model to data and plot results" button to do the regression. The resulting fitted curves' parameter values and corresponding goodness of fit and MSE will then appear above the plot. Often the fit can be improved by using the fitted model's parameters as initial guesses for successive attempts. 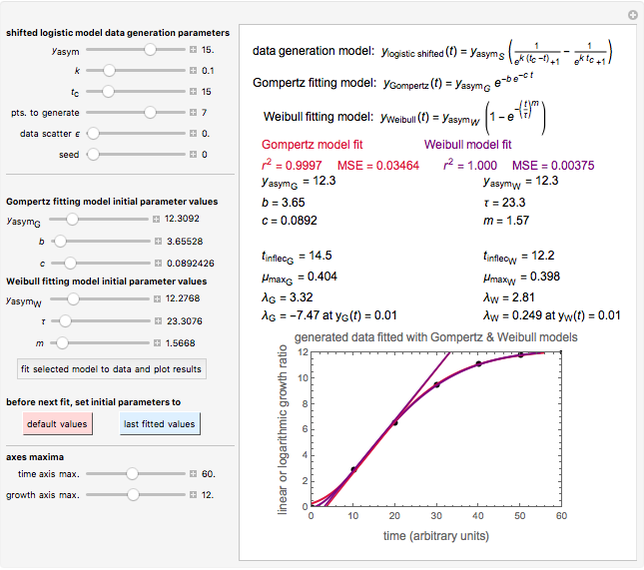 This is done by clicking the light blue "last fitted values" setter and again clicking the "fit selected model to data and plot results" button until the and MSE values remain unchanged. 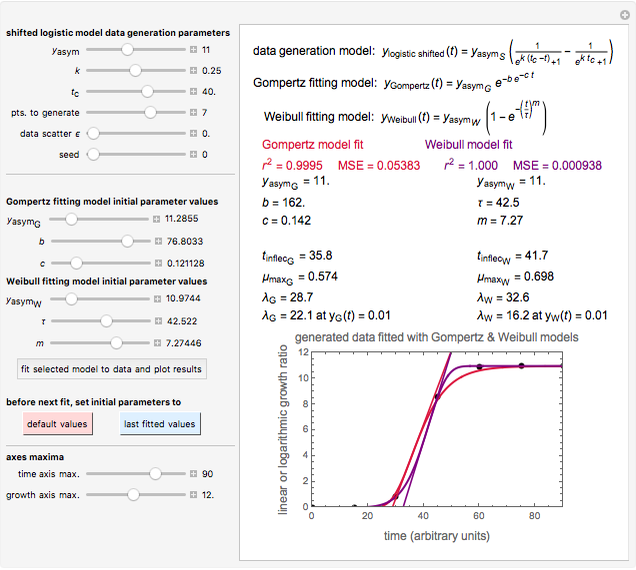 Also displayed are the fit parameters for the Gompertz and Weibullian models, , , and and , , and , respectively, and the corresponding inflection points, and , the slopes at the inflection points, and , the lag times calculated by the tangent method, and , and the corresponding times where and assume the (arbitrary) value of 0.01, at and at , respectively. Notice that growth data generated with the shifted logistic equation, when fitted with the popular Gompertz model (but not the Weibullian), can render a negative lag time, which has no physical meaning. This is one of the results of the Gompertz model's mathematical structure, which implies that but has little influence on its fit. M. H. Zwietering, I. Jongenburger, F. M. Rombouts, and K. van 't Riet, "Modeling of Bacterial Growth Curve," Applied and Environmental Microbiology, 56, 1990 pp. 1875–1881. I. A. M. Swinnen, K. Bernaerts, E.J.J. Dens, A.H. Geeraerd, and J. F. Van Impe, "Predictive Modelling of the Microbial Lag Phase: a Review," International Journal of Food Microbiology, 94, 2004 pp. 137–159. M. Peleg and M. G. Corradini, "Microbial Growth Curves - What the Models Tell Us and What They Cannot," CRC Critical Reviews in Food Science, 51, 2011 pp. 917–945. M. Peleg, Advanced Quantitative Microbiology for Foods and Biosystems: Models for Predicting Growth and Inactivation, Boca Raton, FL: CRC Press, 2006. Mark D. Normand and Micha Peleg "Lag Time in Microbial Growth"